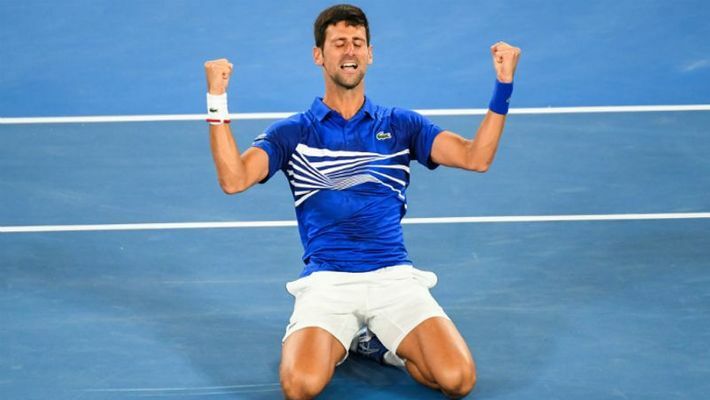 Melbourne: Novak Djokovic defeated Rafael Nadal in straight sets to win the Australian Open for a record seventh time on Sunday. The world no 1 outplayed Nadal 6-3, 6-2, 6-3 for his third Grand Slam title in a row. This was the Serbian top seed's 15th major and he went past American great Pete Sampras (14) be third on the all-time list. His previous six Australian Open men's singles titles came in 2008, 2011, 2012, 2013, 2015 and 2016. Djokovic dominated right from the start of the final at the Rod Laver Arena and opened up a 4-1 lead in the first set. He wrapped the set 6-3. In the second too, Djokovic displayed class and broke Nadal in the fifth game for a 3-2 advantage and went 2-0 sets up with a 6-2 scoreline. Nadal showed signs of coming back in the third but Djokovic prevailed 6-3 to win the title. Much was expected from the title clash but it turned out to be a lopsided affair. Djokovic broke the Spaniard five times and conceded only a single break point. The duo were meeting in major final for the eighth time. Nadal managed to win only two points off his opponent's first even service games.